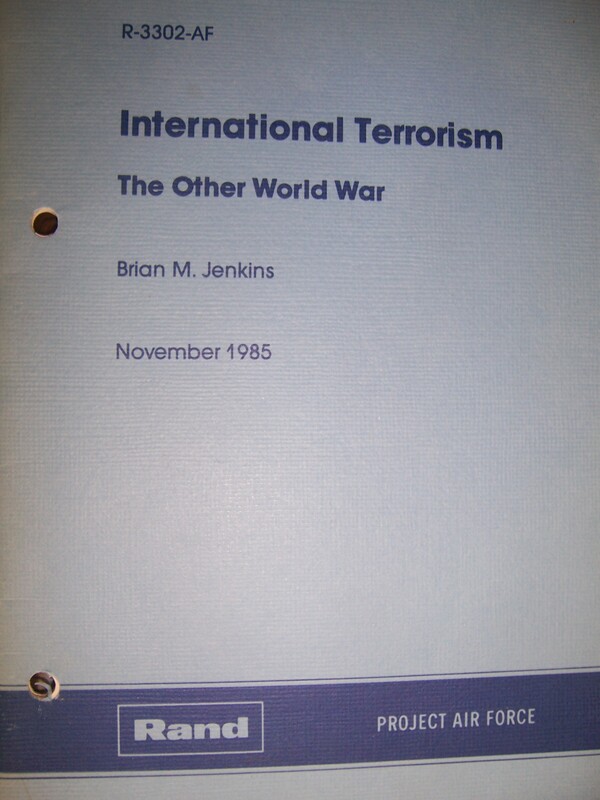 When I entered the Air Force in 1985, I grabbed a pamphlet by Brian M. Jenkins of Rand. The title caught my eye: International Terrorism: The Other World War. Back then, the country was focused on the Cold War against the Evil Empire of the Soviet Union. Jenkins suggested there was another war we should be focusing on. Jenkins correctly notes that the word “terrorism” implies both a political and moral (and legal) judgment. By his working definition, to be a terrorist is to be a criminal. Can nation-states be terrorists? Interestingly, no. Not if you accept the definitional imperative common to international relations. Nation-states draw their identity (and authority) in part by and through their ability to monopolize the means of violence. Because a state monopolizes or “controls” violence in a legally sanctioned international system, it cannot commit a criminal act of terror, however terrorizing that act might be. (By this definition, dropping atomic bombs on Hiroshima and Nagasaki and killing 200,000 people were not terrorist acts, even though the intent was to terrorize the Japanese into surrendering.) Put differently, a state can sponsor terrorism, but it cannot commit it. It’s an unsatisfying definition to many. As Glenn Greenwald, constitutional lawyer and journalist for the Guardian, has noted many times, terrorism as a concept is now so highly politicized, so narrowly defined and closely tied to evil acts committed by Muslim extremists, that the word itself has become polluted. It’s more weapon than word, with an emotional impact that hits with the explosive power of a Hellfire missile. Terrorism, in short, has become something of an Alice in Wonderland word. As Humpty Dumpty put it, “When I use a word, it means just what I choose it to mean — neither more nor less.” Such is the case with “terrorist” and “terrorism”: they’re often just epithets, ones we reserve for people and acts we find heinous. That shout may be satisfying, but it may also be all too easy — and all too biased. Humpty Dumpty hit the ball outta the park on this question. The US was founded by terrorists who engaged in unconventional warfare against the British Crown. Now, anyone who opposes US corporate rule, including people peacefully occupying treetops to try to halt “development,” is deemed a terrorist. The state is an armed apparatus to defend the status quo (the privileges of the elite), and governments certainly do engage in acts of terror, I don’t care what the legalese has to say on the matter. Obama claims a right to assassinate anyone, anytime, anywhere on the planet. It’s “legal” because he, POTUS, says it is!!! Humpty Dumpty lives at 1600 Pennsylvania Avenue, but he changes his physical appearance from time to time. Chicanery, smoke and mirrors, whatever it takes to preserve the status quo will be employed. (b) What is a ‘terrorist’? Although this is sure to sound odd and counter-intuitive, the advance of scholarship in this domain will benefit greatly from enquirers maintaining considerable skepticism about the relevance of recent work in the field of violence and aggression on the part of behavioral and social scientists (et al.) to “terrorism studies”. This is not because “T-acts” are not almost always “violent” (at least as we understand that adjective in ordinary English). They are. The problem is with way behavioral and social scientists have engaged “violence” and “aggression” — a topic consistent with this blog, but outwith the scope of this thread. Some modest measure of conceptual clarity, however, might not be as expensive as one might think. It does not seem difficult to distinguish between (a) the perpetrator of a crime intentionally terrorizing people, who nonetheless is not a terrorist, and who in terrorizing people (e.g., his captives) is not committing an act or acts of “terrorism”, and (b) an individual who has yet ever to cause intentionally harm or fear for some specific goal or purpose, or aid and abet those who intend to do so (or who in fact have done so), but who on account of his/her political motivations (and associations?) and “presumptive preparedness” to act, would most likely count as a terrorist. (3) given (1) and (2) the authors of any such intentional act or act would not self-describe as “criminals” but as combatants who believe themselves justified in authoring acts which otherwise would be merely criminal acts. Hardly an original insight, aye, and hence the valuable nugget of truth in Greg L’s observations: One man’s terrorist is another man’s freedom-fighter. Thanks, RH. Careful and precise use of “terrorist” and “terrorism” has meaning and utility. But nowadays these words are thrown around in our media mainly to vilify or condemn. They are not used with any precision. They’re just used to scare, to denounce, to grab readers’ eyeballs, i.e. look over there! Bad people doing bad things! Be afraid! Indeed, indeed — with one suggestion: The rhetoric of violence/aggression studies (currently my main academic hobbyhorse) is reluctant (loathe?) to use judgmental language like ‘bad’ to describe perpetrators. “Terrorists” aim to advance their causes through “acts of violence”. Where there is the intentional commission of “acts of violence”, there is “aggression”. Since “aggression is a behavior, hostility is an attitude that involves disliking others and evaluating them negatively” and results in “behavior that is intended to cause harm to another person or damage property” (supra), and since “aggression” is characteristic of ASPD (antisocial personality disorder), psychopathy, etc., it is at least highly likely that all “terrorists” are victims of their own dysfunction. They need hugs, and maybe a diet of neuroleptics. So, agreed: There *is* terrific “semantic mission-creep” with “T”-speak, and the Orwellian consequences of it is nightmarish enough. Now, add to that the very real possibility of “terrorist behavior” being “deconstructed” such that the new (enlightened, humane) biosocial “T”-narrative refuses to acknowledge that T’s are normal people behaving intentionally and wrongly, and insists instead that T’s are all victims who require therapy and empathy. Keep up the excellent work, Professor A. I suspect the editors of http://www.globalecco.com would welcome your writing, and the insights which inform it. It has been revealed in recent days that our government ,with Obama”a blessing, has been, not retail, but wholesale shopping all US citizens phone calls, etc. In my opinion this is terrorism, big time, to put fear into the citizenry so that they will conform.,for fear of falling into government clutches for expressing opposing views tothe official line. In my opinion there is no question that terrorism is always done by nation states, most often against their own citizens, and we should not quibble over any legalistic definition that does not recognize this fact. We can see this very clearly today not only in our own country but throughout the world today. What scares me too are the number of people who say, “Let the government listen. As long as it prevents another attack like the one in Boston.” People are so willing to surrender hard-won rights to privacy, hard-won freedoms, in the name of “keeping us safe.” They seem absolutely unaware that power corrupts. “The Lives of Others” is a great German film about the “joys” of living in a state (East Germany) in which you’re constantly being watched. It should be required viewing for all Americans.